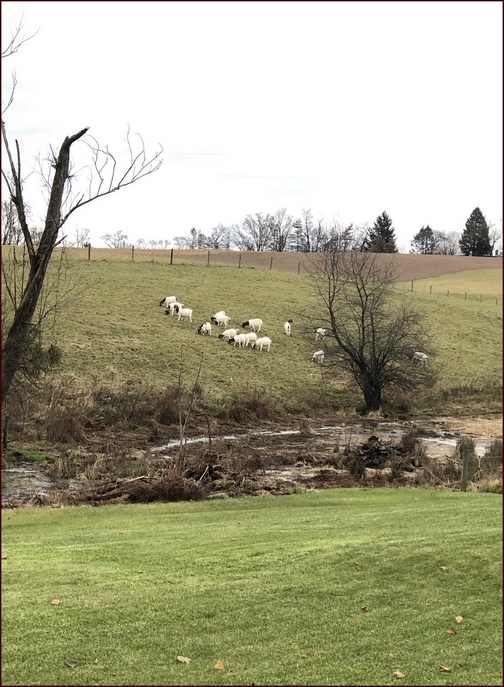 Yesterday we passed this multi-level pasture land with an interesting type of brown-faced sheep in northern Lebanon County. Message summary: Mankind remains “harassed and helpless, like sheep without a shepherd.” Today let us ever keep this great need before us and ever proclaim, “our Lord Jesus, that great Shepherd of the sheep”! “When He saw the crowds, He had compassion on them, because they were harassed and helpless, like sheep without a shepherd” (Matthew 9:36). Now may the God of peace, who through the blood of the eternal covenant brought back from the dead our Lord Jesus, that great Shepherd of the sheep” (Hebrews 13:20). Yesterday morning we passed a sheep farm in northern Lebanon County. We enjoy seeing the sheep peacefully grazing in the pasture, not a care in the world (at least we assume!). Sheep are the most mentioned animal in the Bible, some 400 times (including lambs). Agriculturally they are best known as a very needy animal for their dependency on humans in protecting and caring for them. Not surprisingly the most famous Psalm (the 23rd) and numerous teachings of Jesus allude to sheep. Today there are many needs being heavily promoted as “The greatest need facing the human race.” Included in the top ten “greatest needs” are such causes as healthcare, the environment, the role of government, etc. In the Scriptures there are certain needs common to all humanity such as food and clothing. (1 Timothy 6:8). We also genuinely need love, security, peace, freedom, relationships with others and so forth. Our supreme need is to be in right standing in our relationship with God. We are great sinners, God is a great Savior! Jesus also expresses the very heart of what is the ultimate human need when He described the crowd; “They were harassed and helpless, like sheep without a shepherd”. People continue to be “harassed and helpless, like sheep without a shepherd” which is a result of spiritual separation from God. We are incessantly harassed by the enemy and are helpless apart from our spiritual need being foundationally met through a relationship with Christ who calls people to repent, believe, obey and follow Him. Throughout the Book of Acts and the teaching of the Epistles we see the early Church seeking to fulfill this Ultimate Mission of making “disciples of all nations, baptizing them in the name of the Father, the Son and of the Holy Spirit” (Matthew 28:19,20). We recall a statement from our Bible School days that we still very much believe: “Christ started the church the way He wanted it and He wants the Church the way He started it.” Throughout history the enemy has so often tried to get the church off track but our mission must remain primarily meeting the ultimate human need which is spiritual in nature. Mankind remains “harassed and helpless, like sheep without a shepherd.” Today let us ever keep this great need before us and ever proclaim, “our Lord Jesus, that great Shepherd of the sheep”! Daily prayer: Father, we have freely received Your gift of forgiveness and salvation. Because of this we are motivated by compassion for the lost as we recognize their ultimate human need is to have a spiritual relationship with You. We want to be a part of the ultimate mission in reaching them with the gospel message so that they might have forgiveness of sins and inherit eternal life in heaven. Keep us ever mindful of our mission and obedient to Your leading. In Jesus’ name we pray. Amen. Harassed and Helpless: The most vivid example we’ve witnessed of individuals being harassed and helpless took place some 30 years ago though we can still see it in our mind’s eye today. Brooksyne and I were visiting the orphanage where Ester was born in the Rio Dulce area in Guatemala. With no warning there was a sudden heavy downpour of rain accompanied by flashes of lightning and loud thunder. About 30 to 40 children, many under six years of age, began to cry and run to a dry place but others just dropped to the ground in a fetal position with their arms folded over their heads. One little girl about 4 years old ran to the swing set and began to swing with her body drooped over the swing so that her head faced the ground as she attempted to keep her face out of the heavy splattering rain. The government sponsored orphanage lacked sufficient volunteers and workers for the children, so for the most part, they seemed to be on their own in the midst of a great storm. Brooksyne and I tried to gather them out of the rain but there were only two of us and we didn’t speak Spanish though the children surely understood our good intentions. They were truly like sheep without a shepherd, harassed by the tropical storm and helpless, like sheep without a shepherd, at a time when children would normally have mothers and fathers gather them close and get them to shelter for safety and reassurance. 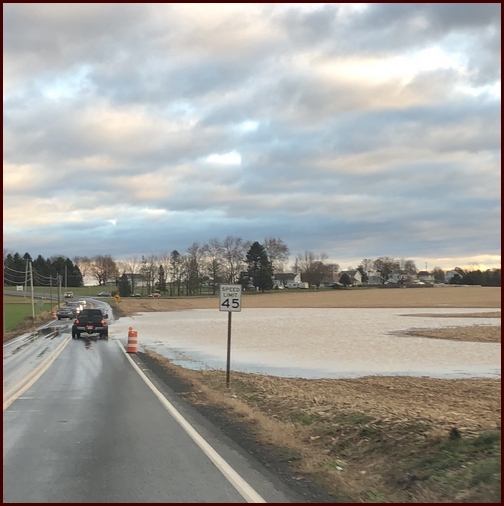 We continue to have a lot of rain in our region and passed this field yesterday that had flooded over the road south of Lebanon, PA.
Thanksgiving Celebration: Our table was pre-set for guests arriving last Friday afternoon. We celebrated with Jim & Dorothy Schmidt along with Jesse and Anna Lapp and their family. Both the Schmidts and Lapps are just like family to us and when we join together we have four generations present. 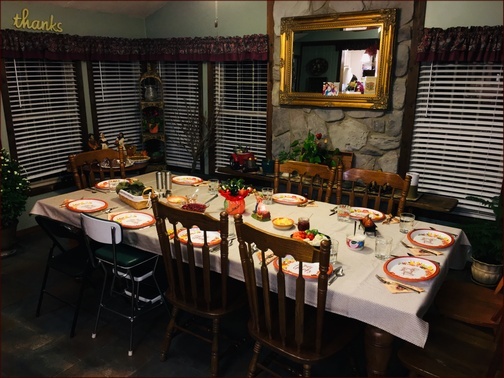 Once the seven Lapp children gathered around the table along with the seven adults it was overflowing, so three children happily sat at our counter bar in the kitchen. 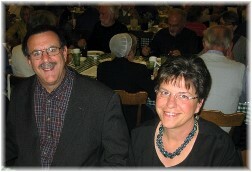 We had a wonderful time of feasting and fellowship that lasted well into the late evening. Song Select has 567 songs with a shepherd theme!